Companies are searching for a safer and more effective way to augment production and efficiency while keeping costs down. Equipment overheating is one of the common productivity issues that production managers try to address. Heat buildup on manufacturing lines are often caused by continuous use of machinery and improper ventilation. To counteract excessive heat in these facilities, portable air conditioners can be employed. Although the temperature outside gets extremely cold in the winter, heat can still build-up in areas where high-powered equipment is stationed. This is where high quality portable air conditioners can help. Instead of using industrial fans, which only move around air regardless of temperatures, portable air conditioners offer more precise cooling. They are also practical and more energy efficient compared to other options. Additionally, exhaustless portable air-conditioners can extend spot cooling solutions where equipment overheating can also affect the work environment of employees. With these practical solutions heat build-up in production sites can be eliminated. For more information, contact Americool LLC. As the temperature continues to cool, warming up large commercial and industrial spaces can be a challenging task for business owners. Since these spaces are larger, they require systems that can put out more heat. Sometimes the existing HVAC system cannot keep up and will fail to sufficiently heat the area while costing more to run. For this reason, many businesses with inadequate heating system turn to portable electric heaters for convenient commercial auxiliary heating. Easy to use portable electric heaters are the best solution for providing sufficient warm to workers inside these facilities. It doesn't require complex installation and they work immediately. Energy efficient electric heaters transform electricity into heat for various needs in various settings. They are also perfect for little used areas or spaces that need extra heat. They are also a perfect substitute for when the main HVAC system is down for maintenance and service. Americool LLC carries high quality portable electric heaters that are available in compact sizes and their portability makes them versatile and able to be moved to areas where supplemental heating is necessary. To find out more about portable electric heaters, contact Americool LLC. We have witnessed how challenging it can really be for communities to get up and running again after Hurricane Michael devastated Florida. Many communities will take weeks if not months to restore. But, emergency services and first responders are still necessary . The spaces, staging areas, and buildings all need temporary power and air conditioning in order to remain safe. The comfort, safety, and health of those providing emergency services is the utmost priority so that work can continue around-the-clock. Taking this into consideration, portable air conditioners can be employed to ensure air quality is regulated. Rental portable air conditioners can bring comfort in these much needed areas spaces like disaster relief centers and staging areas. Americool LLC can provide high quality portable air conditioners that are highly reliable in times of disaster. With our rapid 24/7 emergency support, we can dispatch these durable air conditioning units in no time. Contact Americool LLC for your emergency cooling needs. Precision cooling is essential in laboratories and pharmaceutical facilities. These spaces store highly sensitive items such as lab equipment, research samples, drugs, and chemicals. 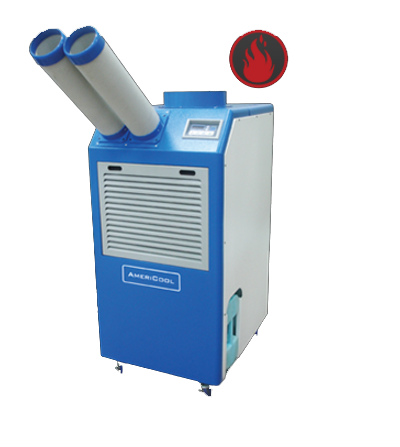 In order to keep samples uncontaminated and keep apparatus and machines in top working condition, portable air conditioner plays a huge role in precisely regulating the in-lab temperatures. Maintaining a specific temperature in critical settings like laboratories can be challenging because these spaces are also filled with technicians and electrical devices which can cause fluctuations. But, by employing high quality portable air conditioners managers and techs will have full control of the environmental temperature. Air quality and humidity must also be maintained to ensure the environment is dust-free and will not promote mold or mildew. Portable air conditioners are compact and portable which means they are easy to use and they can be easily moved to the areas where cooling is most needed. Moreover, portable air conditioners can be further configured to meet the distinct requirements in various laboratory settings. This cooling equipment can help optimize the operation and efficiency of these facilities. Contact Americool LLC for more information on high quality portable air conditioners. Despite the weather, there are still commercial spaces that require portable air conditioners in order to maintain a comfortable temperature indoors. An example of this need is hospitals and other healthcare facilities. These spaces get crowded especially during seasonal change in weather as the young and older segments of the population become sick. Additionally, as the temperatures drop, humidity builds up indoors. Running high quality portable air conditioners can aid in dehumidifying the air maintaining air quality. Rental portable air conditioners are equipped with heat pumps as well. When the thermostat is set to heat they can warm the space when needed. Portable air conditioning units are useful even in the colder months. The dual functionality makes them ideal for various commercial and industrial settings. Contact Americool LLC to find out more about the advantages of portable air conditioners. Many North Carolina residents lost their homes during the recent hurricane. Families resided in disaster relief centers to take refuge during and after the devastation. These temporary shelters get congested and uncomfortable with evacuees and response team crowding the limited space. Thankfully, portable air conditioners can provide cooled and filtered air..
Dual purpose portable air conditioners are incredibly necessary in disaster recovery shelters. With this equipment in place, a comfortable indoor temperature for both affected families and rescue teams can be maintained. Heat can easily buildup in cramped spaces. Portable air conditioners can help cool the space and maintain air quality. During a hurricane, there is enough to worry about, recovery centers should be as comfortable as they can be for residents and relief workers. When disaster strikes, stay one step ahead with a dependable partner to count on. Contact Americool LLC for emergency cases that require high quality portable air conditioners. The fall is a combination of some cool nights and warm days. During the day, temperatures can even be really warm but as soon as the sun goes down, the temperature drops. To ensure the climate inside commercial and industrial buildings remain comfortable, dual purpose air conditioners can be used as a cooling system during the day and as a heater at night. With these dual purpose portable air conditioners, companies can save because they no longer need two different units and additional equipment for heating and for cooling. This equipment is also more practical for business with smaller equipment space since there is only one unit for heating and cooling. In terms of performance, these high quality portable air conditioners have the capacity of 16,800 BTu/h cooling and 18,500BTu/h for heating and can operate at 54-113 degrees range. They are heavy duty and can provide heating and cooling for all types of commercial space. With these portable air conditioner units, companies are spared from the hassle of managing and maintaining different equipment. Having two systems means more costs. Dual purpose HVAC systems means two types of equipment for the price of one. Contact Americool LLC to find out more about this unit.